MOTORIZED! Can be connected to home automation systems such as Control 4, Crestron, and similar. With the push of a button, this mount extends your TV out from the wall above your bed's headboard so you can watch TV comfortably while lying down or sitting up in bed. Closing flat against the wall your television will be completely hidden. The arms of the mount are designed to conceal the cables that connect to your TV. You can easily install these cables yourself. When you’re not watching TV, simply close the mount to completely hide your TV behind the attached picture frame. Introduced in 2010, our manually operated Extended Flip-Out has proven itself against the test of time. Our first customers still use theirs today! In 2012 we received an INNOVATION AWARD at CES for this product, and in 2014 we received patent approval! This is our newest upgrade, introduced in September 2017. You can fit up to 6 cables total (3 in each arm). Cables are easily installed inside channels along both arms. Through careful design and testing, we developed this patented design that counter-balances the TV's weight through a system of cleverly arranged linkages that do not wear over time. This product is made of steel parts and is incredibly strong, rigid, and reliable. It will stand the test of time. We use 3 layer bearings (Teflon coated, brass lined, and steel backed). The mount is driven by two high-torque Planetary Gear motors. Should any issue arise with a motor, they are replaceable. 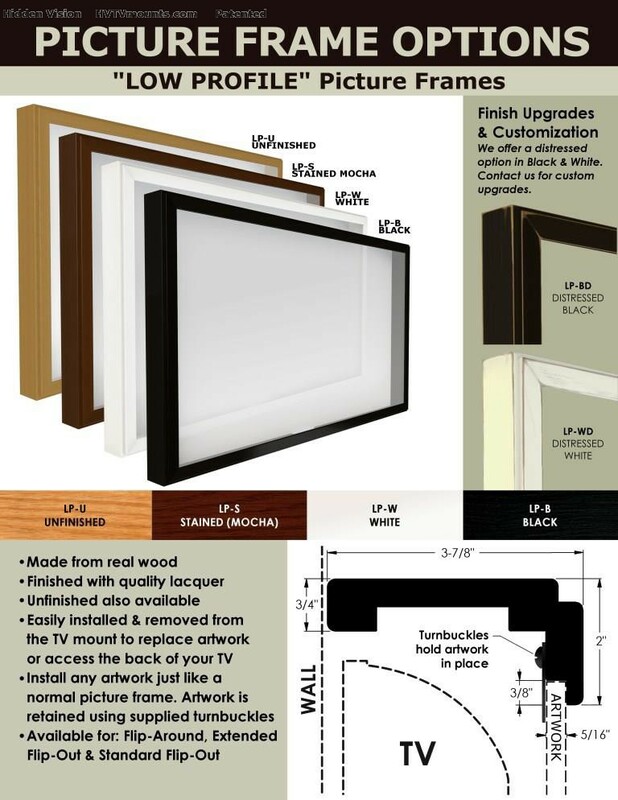 * The outside dimensions of your picture frame may vary +/- 1/8" due to varied molding thickness. Contact us for more information.